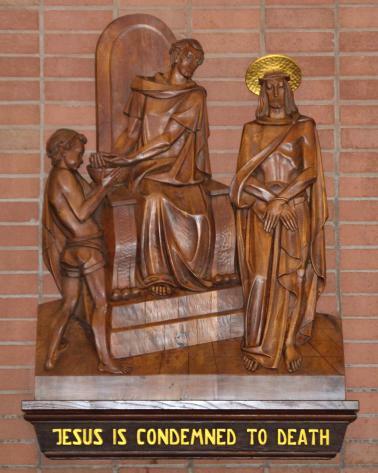 Station 1: Jesus is condemned in Pilate's court, as shown in this carved bas-relief at Our Lady Queen of Martyrs Church, Fort Lauderdale. 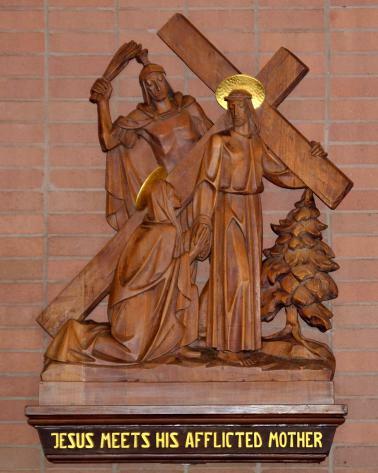 Station 2: The cross is laid upon Jesus, as shown in this carved bas-relief at Our Lady Queen of Martyrs Church, Fort Lauderdale. 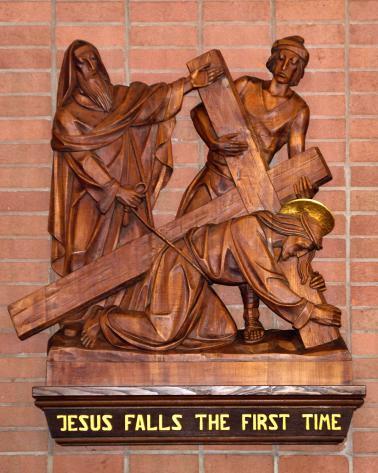 Station 3: Jesus falls the first time, as shown in this carved bas-relief at Our Lady Queen of Martyrs Church, Fort Lauderdale. 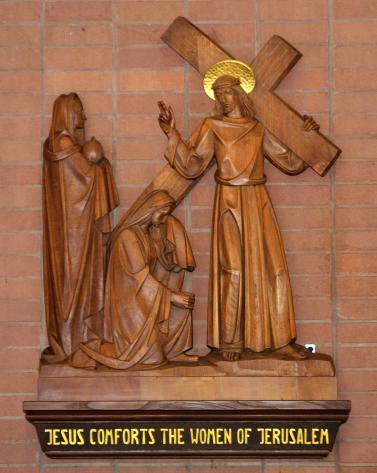 Station 4: Jesus meets his mother on the way to Calvary, as shown in this carved bas-relief at Our Lady Queen of Martyrs Church, Fort Lauderdale. 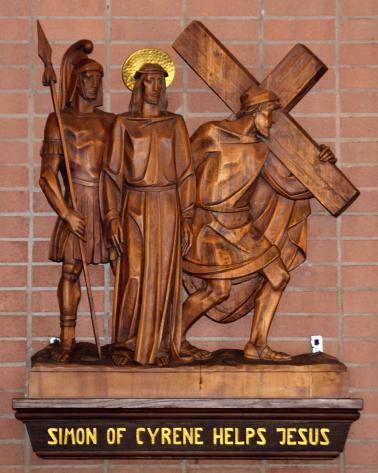 Station 5: Simon of Cyrene carries the cross for Jesus, as shown in this carved bas-relief at Our Lady Queen of Martyrs Church, Fort Lauderdale. 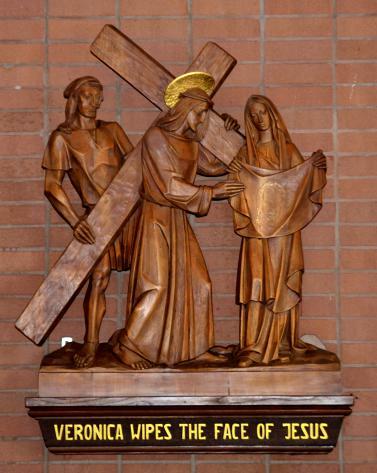 Station 6: Veronica wipes Jesus' face, as shown in this carved bas-relief at Our Lady Queen of Martyrs Church, Fort Lauderdale. 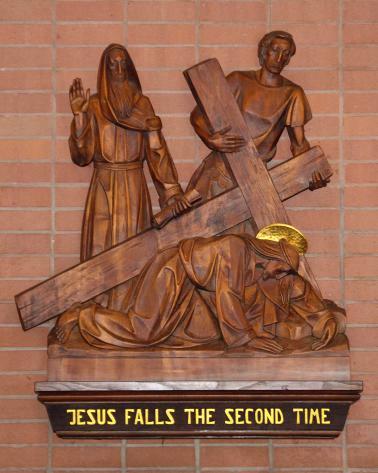 Station 7: Jesus falls for the second time, as shown in this carved bas-relief at Our Lady Queen of Martyrs Church, Fort Lauderdale. Station 8: Jesus speaks to the women of Jerusalem, as shown in this carved bas-relief at Our Lady Queen of Martyrs Church, Fort Lauderdale. 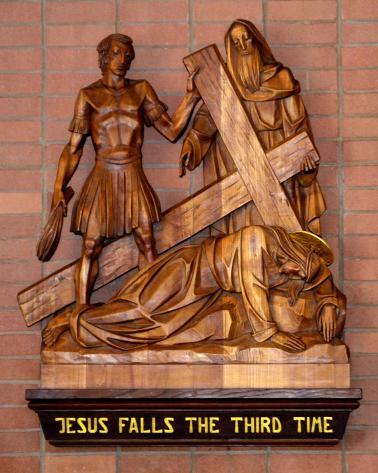 Station 9: Jesus falls for the third time, as shown in this carved bas-relief at Our Lady Queen of Martyrs Church, Fort Lauderdale. 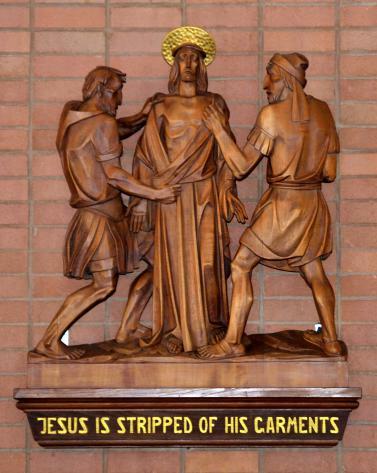 Station 10: Jesus is stripped of his garments, as shown in this carved bas-relief at Our Lady Queen of Martyrs Church, Fort Lauderdale. 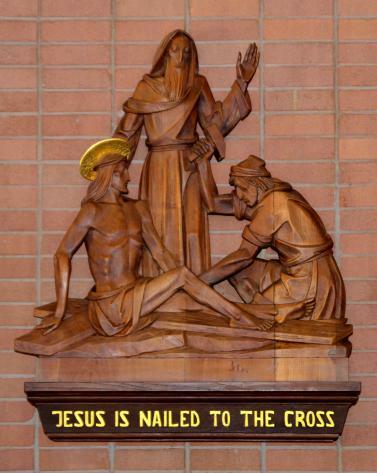 Station 11: Jesus is crucified, as shown in this carved bas-relief at Our Lady Queen of Martyrs Church, Fort Lauderdale. 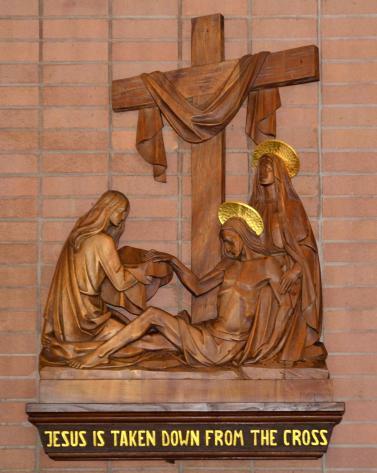 Station 12: Jesus dies, as shown in this carved bas-relief at Our Lady Queen of Martyrs Church, Fort Lauderdale. 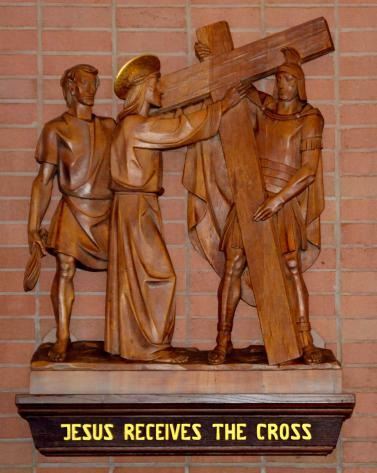 Station 13: The body of Jesus is taken off the cross, as shown in this carved bas-relief at Our Lady Queen of Martyrs Church, Fort Lauderdale. 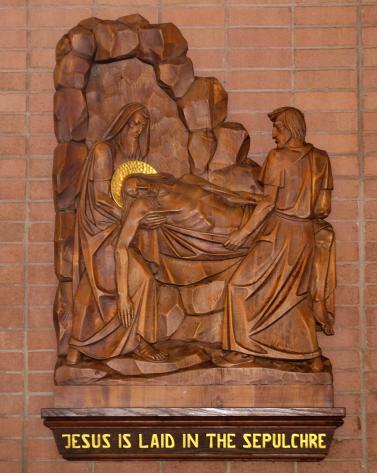 Station 14: The body of Jesus is entombed, as shown in this carved bas-relief at Our Lady Queen of Martyrs Church, Fort Lauderdale. FORT LAUDERDALE | Every year, many Catholics go on a Holy Land pilgrimage without leaving their churches -- via Stations of the Cross. The Stations are a series of 14 devotions that receive special focus during Lent, especially on Holy Week, which began today with Palm Sunday. Most Catholics see them as plaques on their church walls, but the Stations are based on real sites in Jerusalem. The route is called the Via Dolorosa, or the Way of Sorrow, for the path Jesus took from his condemnation by Pontius Pilate to his burial in a rocky tomb. Each of the 14 Stations recalls an event recorded by tradition. They include his sorrowful meeting with Mary and his warning to the women who wept for him. They tell also of Simon, the man who carried the cross for Jesus. And a mystical incident tells of a woman called Veronica wiping Jesus’ face, then finding its image on her cloth. During formal devotions, a priest or other leader pauses at each Station and offers a meditation on the meaning of the event. He may also read the scriptural background to the Stations. Pilgrims walked the original route in Jerusalem at least as early as the fourth century. Saints Jerome and Sylvia mentioned the crowds who came to trace the Passion of Christ. In the Middle Ages, pilgrims were given indulgences for praying at some of the sites. Medieval Franciscan friars then began setting up symbols of the holy places, with plaques and other objects, in churches and monasteries and gardens. St. Petronius even commissioned a chain of chapels in Bologna, Italy, for various parts of the Passion. Those sites multiplied after Turkish Muslims conquered the Holy Land and made access to Jerusalem harder. 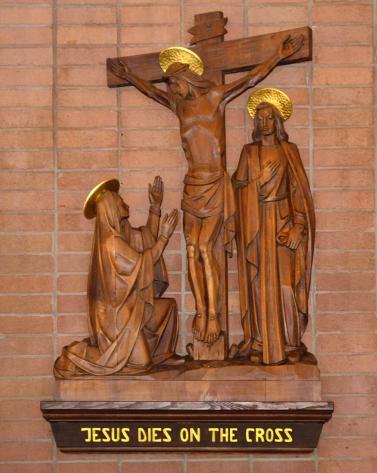 Nowadays, the Stations may be bronze or ceramic or stained glass — or in wood, as are the carved bas-reliefs at Our Lady Queen of Martyrs Church, Fort Lauderdale. But many worshipers may be surprised that today’s format for the Stations is rather recent. It wasn't a general devotion before the end of the 17th century, according to the Catholic Encyclopedia. Churches and religious orders didn’t even agree on the order or number of the Stations — one group of friars set them as high as 37. They also didn’t agree on what constituted the Stations. Medieval carvings at Nuremberg show Christ falling seven times, rather than three as in the modern-day Stations. And the Veronica incident doesn't appear in many earlier accounts. In 1731, Pope Clement XII finally settled the number of Stations at 14. And in 1742, Benedict XIV urged all priests to add the devotion at their churches. The Stations can be done in public or in private, by groups or individuals. These days, Pope Francis holds them on Good Friday at the Colosseum in Rome — a tradition that goes back to Benedict XIV. Recent years have also seen a 15th station, the Resurrection. It’s not considered part of the traditional Stations, but many believers prefer to look toward Christ’s triumph over death, celebrated on Easter. Just as the Stations of the Cross are a symbolic Holy Land pilgrimage, some crucifixes can become symbolic Stations. If the crosses are properly blessed, they can be used to minister to those who are sick or imprisoned or at sea.